Let's have a bit of fun prediction fun. Now that nearly all proper G3 are a decade old, how do you think their prices will mature? Do you think this shift will happen similarly to how the G1 pricing has shifted over the past years? I'm absolutely loving how cheap most of them are! And they're still fairly abundant at thrifts and garage sales. I'd imagine this will drop off in the next few years as people dig up collections for college, sell them off, and then leave them as is. Who do you think will go up in price who is not currently all that collectable? I always thought the G3 unicorns and diva poses will spark collecting fever someday. As they aren't so common. I can see Sunrise Song fetching a good price someday. Also ones with cool tones. Like Autumn Skye. Beautiful name too. I think now that we're seeing new community members saying, "I grew up with G3," prices will increase with their demand for nostalgia, just as ours have with G1 and, to a lesser extent, G2. The oldest G3s are 16 years old now! (I bought my first two - Kimono and Pinkie Pie - at Kay-Bee Toys in my senior year of high school in 2003! ) Now is the time to buy, while they're still relatively cheap. Of course, the ones I'm still missing have never been cheap. Except for the Core 7 ones that I just didn't buy. I almost feel guilty about my plan to eventually open all of my MIP G3s. But I'll probably do it anyway. Open them before gen 5 comes out or before they're 20 years old. I agree that now is a good time to buy, especially since it's yard sale/flea market season. I, for one, have found maybe 15 G3s at 2 flea markets so far. They're usually $1 each but it's hard to sell the common ones for more than $2-3 each, especially this time of year. G3 had a lot of interesting color combinations due to the variety in their hair color so more colors will probably make any given pony more valuable. I know the hair colors were a big reason why Twinkle Eye G1s are so sought after. Well, anything mail order tends be popular/more expensive, so I imagine Sun Shimmer and Love Wishes will rise in price. So will ones with more elaborate cutie marks, or gradient shading, just because they’re somewhat rare and look really nice. The Pegasus with actual cloth wings probably will become more valuable too. And of course the ComiCon ponies. I think I remember Guava Lava being kind of expensive already? I found her for pretty cheap, but I couldn’t find her in past sales on eBay so she may be pretty rare? Oh, and the henna/makeup pony versions! 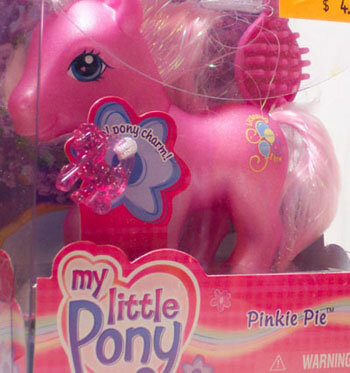 I’ve found some of the McDonald toys, but I think I only found Pinkie Pie as far as real ponies go. Exclusives will always demand more, I think. International Super-Long Hairs, Licensing Shows, Rosey Posey, Bay Breeze, Pony Project exclusives, birthflowers and birthstones (especially since TRU is gone), Anchors Away. Everybody loves Port-o-bella, and she was hard to find at the time. The second set of Breezies too, some of the later Target exclusive babies. That unreleased breast cancer pony, Ribbons and Hearts? And the SDCC alternate hair color from 2010. I really loved the 2005 Butterfly Island ponies. Their tropical colors just drew me in. And ponies in the Sunny Daze pose. I actually don't see Love Wishes going up in price for awhile. Just because she was so overproduced. They were selling her in "party packs" on HasbroToyShop. Plus sent 400 to MLP Fair staff in 2006 as an "exclusive," which became Frisco and Trolley. They're probably more sought after than actual Love Wishes. Birthflowers are already up there and a bit tricky to find. I think the Birthstones are close behind but a bit more avaliable? I've certainly seen more online, at least. Totally agree that the cascading marks are gonna be goin' up. I'd like to get a full set of Pegasi so I need to get on that soon. I think the unicorns and maybe the pegasus ponies will be more valuable because there were so few produced, Sweetie Belle aside (although I do like her for customs because she's already white). Thistle Whistle has been the most popular pegasus for awhile. That probably won't change. She's not pink or purple, and she smells good. 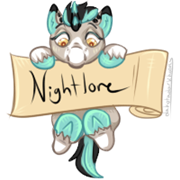 The birthstone ponies are more common than the birthflowers, but they still sell for $15+. And I still really want that 2008 press pack for the 25th anniversary that looks like a cake and has Pinkie Pie and repro G1 Cotton Candy in it. 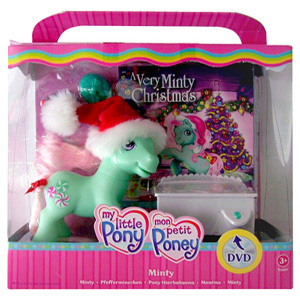 Minty will probably go up because it’s Minty I know there’s a super rare version of her. Something to do with ice skating I think? Do any if the 30 Pinky Pies count as rare? There's an international exclusive Minty that's harder to find. 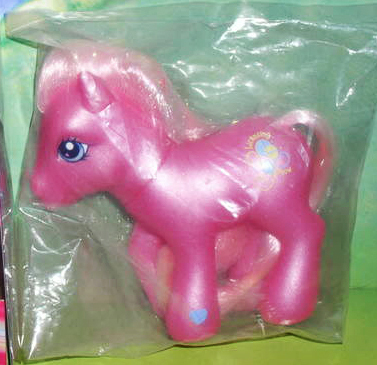 Pinkie Pie... only Licensing Show and the 2007 Fair Exclusive are really rare/HTF. 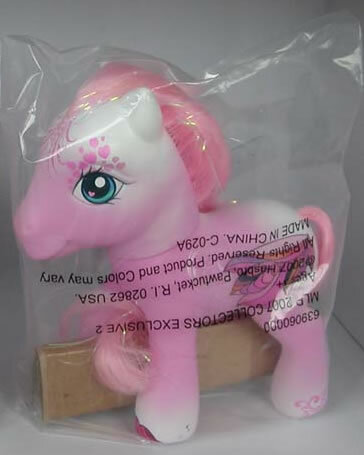 And maybe the 1st 50 Pinkie Pie, which is just standard PP w/ a sticker and certificate that she was one of the first 50 off the production line. I think I'll predict that the pony charms and ponies that come with their pony charms will become more sought after. It was actually really difficult to keep all my charms from getting lost when I was little; they're so small and easy to lose. Having the bracelet from the points program helped because I loved wearing all the charms together, and apparently never took them off it so when I dug up my toy boxes they were all nicely together (phew). Likewise, G3 had a lot of interesting merch. I feel that plushies will probably go up in value, as will some of the quirkier merch that they made. I also think that after reading the thread on 'why x pony is so popular', more unusually colored ponies will see a rise in popularity. I too have found myself hankering for yellow and green ponies as I entered adulthood. Huh. They must be colors that commonly appeal to adults. Yeah, it’s really weird how cheap G3 MIBs are right now. If I collected MIB I would be buying so many things. I think yellow/green ponies interest us more because we were drawn to pink and purple more as kids, but because of that there are a lot of pink or purple ponies. The yellow or green ones stand out because there are less of them, and we weren’t as interested in them as kids so we probably don’t have them already. This makes them rarer too. I personally really like the red ponies, and there aren’t many of them, so maybe those will go up too? I think we will see G3 prices slowly start to increase as they slowly become more difficult to find in the wild. Like other gens I think the more “fancy” ponies will increase in price faster than others. Like the “special editions” of Cherilee, Pinkie and MLP fair ponies. I personally don’t collect G3 - but I do love the ponies with symbols that go down their legs. I may end up snapping a couple that I live before the prices greatly rise now to be honest. These being the G3’s that may find their way into my collection. I really like Pretty Paisley. Her cutie mark isn’t that fancy, but she has such cool gradient shading. I could see her getting expensive later.